I have sat in the seats at each of the first three rounds of the AMA Supercross series. I have watched the races carefully, both as a journalist and as a fan (primarily, as a fan). It is an understatement to say that this year has been surprising, so far. Honda’s Ricky Carmichael and Yamaha’s Jeremy McGrath got virtually all of the pre-series press. Carmichael came off an amazing year (including 13 straight supercross wins), in which he defeated seven-time champion McGrath (and displayed total dominance). McGrath vowed to come back this year and take the championship (claiming he was “caught off guard” by Carmichael last year), and signed a big, new sponsor for his McGrath Racing team (Bud Light). The stage was set for the Ricky/Jeremy show. It didn’t happen (it appears likely to never happen). Other riders have emerged as the favorites, including Yamaha’s David Vuillemin (winner of two out of three rounds, so far), Honda’s Mike LaRocco (second in points, and winner of the most recent round), and Suzuki’s Travis Pastrana (who displays amazing speed and more poise this year than in the past). In front of the American crowd, however, LaRocco has clearly emerged as the star of AMA Supercross. The quiet, Indiana native, who doesn’t complain about bike set-up, arm pump or anything else at the end of the race (and the fans do appreciate this — believe me), shows up every week to do his job, and let his riding do the talking. His riding has done plenty of talking this year, and the fans are listening. LaRocco now receives the largest round of applause from the fans in attendance at AMA Supercross events. He is the one they are pulling for, and it is his quiet, no-B.S. approach (coupled with blazing fast riding) that has won them over. When the series leaves Jeremy McGrath’s back yard in two weeks, the applause for LaRocco, and the number of fans pulling for him, will get even bigger. Despite signing Ricky Carmichael, and blatently displaying Carmichael as the star of its motocross/supercross team at the Honda dealer convention late last year, Honda has to be figuring out that LaRocco, not Carmichael, is currently the biggest, and most effective, promoter of their motocross bikes. LaRocco, and not Carmichael, is the guy who can make riding Hondas cool, again, even in Southern California where the motocross practice tracks are literally a sea of blue Yamahas at the moment. Carmichael, of course, had his PR difficulties this year. His switch from Kawasaki has bothered many fans — either because they feel he has been disloyal to Kawasaki (the brand he has ridden since he was a kid) or they simply do not like how much money he is reportedly making at Big Red. LaRocco has not become the star by default, however. He has simply out-ridden Carmichael. Indeed, it was pressure from LaRocco that caused Carmichael to have his big crash at the first round of the series (also at Anaheim). Since then, LaRocco has beaten Carmichael in every main event, and even passed Carmichael after a patented LaRocco poor start. The statistics back-up LaRocco’s success on the track. His lap times are faster than both Carmichael’s and McGrath’s. Indeed, it is LaRocco’s lap times that indicate how difficult it will be for Carmichael and McGrath to beat him this year. LaRocco has always had better conditioning than his opponents, and has been able to charge hardest at the end of a race. This year, however, his starts are much better and his opening laps are much faster. If you had spoken to riders and devoted fans in the last couple of years, they would have unanimously said LaRocco would be unbeatable if he combined his late-race charges with good starts and fast opening laps. Guess what? This is exactly what LaRocco is doing this year. Another indication of LaRocco’s speed is what happened at the most recent Anaheim race last Saturday evening. LaRocco was able to catch and pass David Vuillemin late in the race. 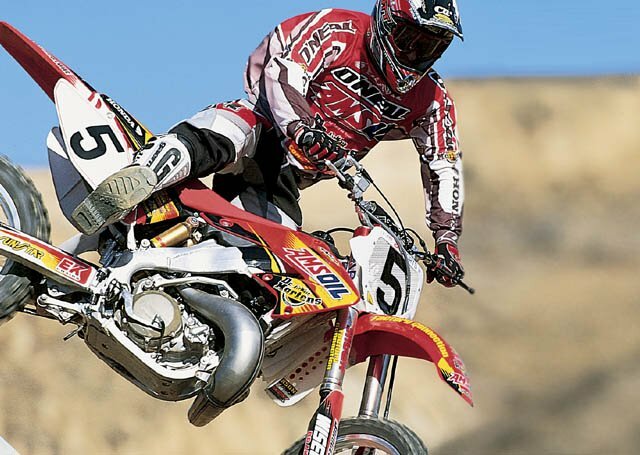 This is exactly what Travis Pastrana was unable to do the week prior in San Diego. Vuillemin is extremely fast, and has good endurance. This is why Pastrana could not catch him, and why LaRocco’s victory in Anaheim is all the more impressive. At nearly 31 years of age, “The Rock” has had plenty of success, including two National championships, but it has taken many years for him to emerge from the shadow of Jeremy McGrath and other riders on the Supercross circuit. He earned it the old fashioned way, with hard work and quiet determination. Things earned that way tend to last, and LaRocco could be one of the sport’s biggest draws for several years to come (despite his age).